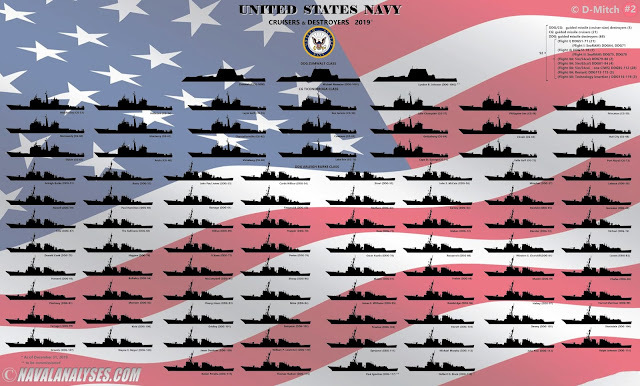 In the following infographic, The United States Navy Cruisers & Destroyers in 2019, I depict all the cruisers and destroyers that will be in active service with the United States Navy by December 31, 2019. A similar graph (#1) titled The United States Navy Submarines in 2019, illustrates all the submarines that are in active service with the United States Navy in February 2, 2019. Currently, the United States Navy operates a massive amount of powerful guided missile large surface combatants, 92 in total (! ), consisting of two 190-meter Zumwalt class destroyers (DDG) (which are actually 16,000ton cruisers) with one more vessel to join the fleet this year, 22 Ticonderoga class cruisers (CG) (of which one vessel, the USS Bunker Hill, will be retired this year, being the first of the class with the exception of the first five with the Mark 26 twin-arm launchers) and 66 Arleigh Burke class destroyers with two more vessels to join the fleet this year. 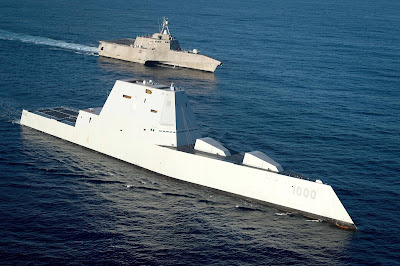 The Ticonderoga class cruisers are "double enders", and along with the Zumwalt class "destroyers", are the only surface combatants in the US fleet that can employ two large caliber guns simultaneously. 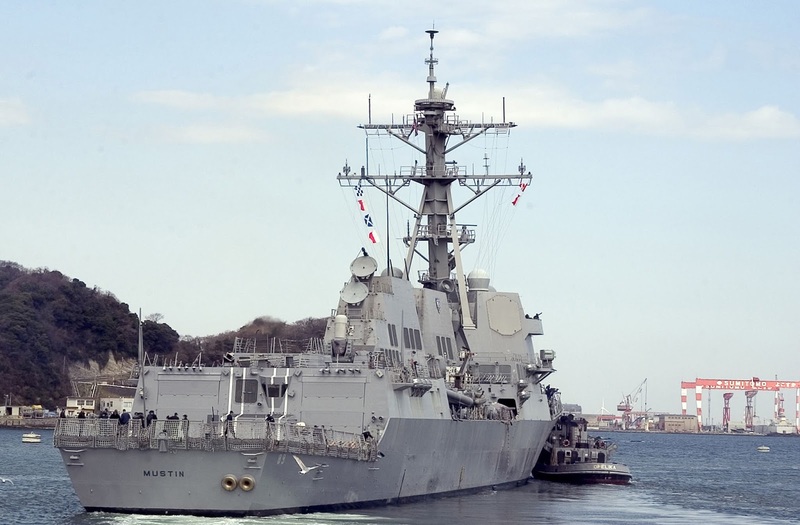 Ticonderogas have received several upgrades including the removal of the AN/SPS-49 radar and the installation of the SPQ-9B radar on the first 11 vessels in the class. Currently, the US Navy has no frigates in the fleet. However, if the littoral combat ships of the Freedom and Independence classes will receive anti-ship and anti-aircraft missile weapons, they will be considered as light frigates. The lead ship of the Zumwalt class destroyers with an Independence class LCS. The latter might reconfigured to a light frigate in the future. 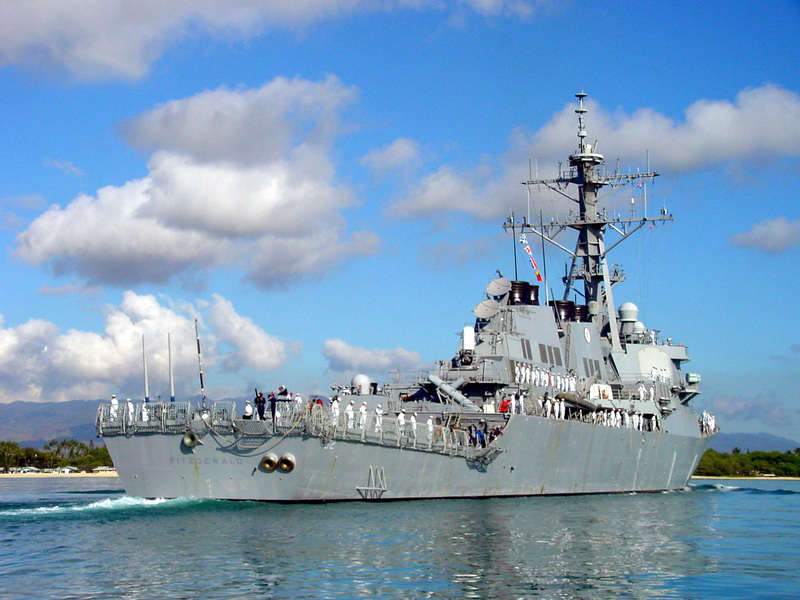 Note that there are sever differences among the vessels in the Arleigh Burke class. The "Flight II Arleigh Burke" ships have the following improvement over the original Flight I: incorporation of combat direction finding, SLQ-32V-3, TADIX-B, JTIDS command and control processor, and the capability to launch and control SM-2 Block IV Extended Range Missile. The "Flight IIA Arleigh Burke" ships have several new features, beginning with USS Oscar Austin (DDG-79). Among the changes is the addition of two hangars for antisubmarine warfare (ASW) helicopters, and a new, longer 5-inch/62-caliber (127 mm) Mark 45 Mod 4 naval gun (installed onto USS Winston S. Churchill (DDG-81) and later ships). Later Flight IIA ships starting with USS Mustin (DDG-89) have a modified funnel design that buries the funnels within the superstructure as a signature-reduction measure. The Flight IIA ships have no Harpoon missile launchers. Ships from DDG-68 to DDG-84 have AN/SLQ-32 antennas that resemble V3 configuration similar to those deployed on Ticonderoga class cruisers. DDG-113 to DDG-115 are "restart" ships, similar to previous Flight IIA ships, but including modernization features such as Open Architecture Computing Environment. DDG-116 to DDG-121 will be "Technology Insertion - TI" ships with elements of Flight III. Only one vessel of the Flight IIA TI is currently in active service while two more vessels will join the fleet this year. A number of Flight IIA ships carry one only Phalanx CIWS while two vessels of the Flight I and two of the Flight II (all four destroyers patrolling with the U.S. 6th Fleet based in Naval Station Rota, Spain) have a SeaRAM system in the place of the aft CIWS. 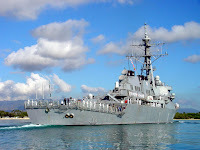 There is a number of Arleigh Burkes, such as USS Pinckney, USS Momsen, USS Chung-Hoon, USS Nitze and others, that have superstructure differences to accommodate the Remote Mine-hunting System (RMS) and their Mk32 torpedo launchers were moved to the missile deck from amidships as well. The United States Navy cruisers and destroyers in 2019. For a high resolution image click here. These are great, really enjoy them. FYI This is from a congressional report about the new FFG(X). "The designation FF, with two Fs, means frigate in the same way that the designation DD, with two Ds, means destroyer. FF is sometimes translated less accurately as fast frigate. 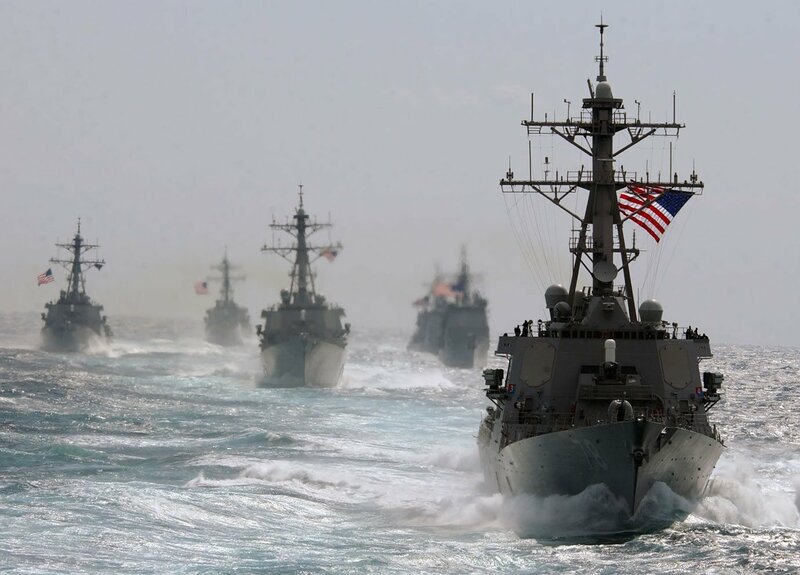 FFs, however, are not particularly fast by the standards of U.S. Navy combatants—their maximum sustained speed, for example, is generally lower than that of U.S. Navy aircraft carriers, cruisers, and destroyers. In addition, there is no such thing in the U.S. Navy as a slow frigate." Nevertheless, I will correct it because it makes more sense what you said. Thank you so much! Great work as usual, but I some corrections. First, only the 11 oldest Ticonderoga-class cruisers (Bunker Hill through Chancellorsville) have received the modernization that removes the AN/SPS-49 and adds the AN/SPQ-9B (you also have a typo were you describe the former as the "AS/SPS-49"). Second, I'm pretty sure the LCS designation is here to stay. The article you cite is 4 years old and the official quoted in it left office 2 years ago. Three LCS have already been commissioned in 2019 and none of them were designated FF. Thank you for your comment. I am aware of the modernization of the first 11 vessels, the way though I mentioned was confusing indeed. I improved the text. I have corrected the information I provide also about LCS and the VDS of Arleigh Burkes. Thank you so much again!